Niagara's Watercooler: What Will 2018 Bring? It has been a while since I have written anything here, or done much of anything outside of my home. Maybe you are wondering where I have been, maybe you haven't. But I feel like I at least owe an explanation to the good people who have taken the time over the past few months to read what I write. My intentions for 2018 are ambitious. However, what my body will actually allow me to do is another question. I used to love the winter. I really did. I looked forward to it every year with that same kid-like anticipation I have for Christmas Day. While I will never lose my enthusiasm for Christmas, my general enthusiasm for just about everything else is waning fast. Winter is supposed to be the time I feel rejuvenated and ready to take on the world, but that seems to no longer be the case. Now I have the heat and humidity of summer keeping me down, and the cold of winter is not the splash of water in the face it used to be. The truth is that I have not done much of anything since early December. Last year at this time, Craig and I were running around doing hockey games and a bunch of other stuff. But the last public thing I have done is Hockey Day, and that was the day after Thanksgiving. When the intense cold hit, my energy levels dropped even lower than normal. My back has also decided that it really hates single-digit weather, and I have been unable to walk without serious pain. The result? I honestly don't ever leave the house anymore. I drag myself to band practice and prepare for our show in January, but even that is a colossal struggle each and every week. So what have I been doing about it? All I can do is sleep. Today, for example, I was awake long enough to watch two periods of the Winter Classic, eat dinner, and write for about an hour. The rest of the day I have spent sleeping. And every time I wake up from a two or three-hour midday nap, I frustratingly tell myself that I HAVE to get moving and get things done. But no matter how hard I try to motivate myself, my body shuts down again. Is this the result of my condition or just me getting old? I know plenty of people my age who do not exercise or do anything special for their health and they get along just fine during the winter. So, I am left with only one other explanation. Now it is a process of going back to the same doctors who have been keeping me alive for over two years and tell them that I don't have much of a life to live for. I sleep, I eat, then I sleep again. That is all I do. It is like being caught in a nightmare from which, if you will pardon the pun, I cannot wake up from. Now cancer has taken away my favorite time of the year. If the solution to this issue is more medication, then I will refuse. I am sick of medication and medication is probably what is partially causing the problem in the first place. But my doctors and I will discuss it, and probably come to the conclusion that I just have to live with these changes . . . again. So what does that mean for 2018? I have good days, and I have bad days. On the good days, I will create what I can and try to stay as relevant as possible. On the bad days, you won't be hearing from me. Will this change in the spring? If I knew the answer to that . . .
George N Root III is a Lockport resident who is slowly seeing the things he loves to do stripped away one by one. 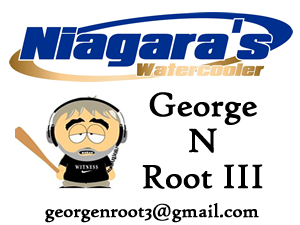 You can follow him on Twitter @georgenroot3, or send him a message at georgenroot3@gmail.com.